It seems it shouldn't be that hard to implement. Generating grids of white and black blocks should be quite easy in a browser. You could try GNU Barcode. I'm not aware of an open-source Java QR Code encoder, no. We have an encoder internally and it's on the to-do list to port that, clean it up, and release it too, but the decoder is a priority at the moment. This is only for reading barcodes. I'm unsure why we would need barcode software for 2d bar codes, or even why 2D bar codes are around. Aren't regular bar codes doing the job just well enough? Ha, that is a fair question. 1D barcodes, meaning UPC or EAN barcodes typically, only encode a string of numbers, typically a product number. Formats like Code 39 or Code 128 can potentially represent text, but their size tends to get unwieldy. 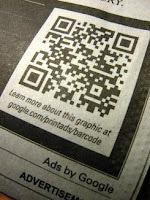 For whatever reason, formats like QR Code sprang up. They cram more data into a smaller space and add features like error correction. Their size and ability to handle more complex data like URLs and contact information made them useful. I suppose I'd say it's because 2D barcode formats are much more suitable for more interesting applications like encoding URLs and contact information. Another reason for 2D barcodes is that they are easier to scan using a camera. A big problem with 1D barcodes is that the thickness of the bars has meaning. 2D barcodes have two useful features: all blocks are the same size and there is error correction built in if you manage to scan a few blocks wrong. I just found your post and got to admit i found it very interesting! A while back I brought some software so that I was able to print out my own barcode labels. The software was not really that good as it would never properly create my barcode labels. In the end I found a British labels company who printed my barcode labels for me at a low cost. It saved me a lot of messing around really! 2D barcode scanners can carry a ton more information than a regular 1D. mrgs, you would need 2D software to print a 2d barcode. As a marketing developer for a barcoding company, I'm really excited to see how this will change advertising. I want to know about color 2D barcods and reader softwares.who can help me? 2d Barcode reader is going to be essential in the every new phone. Your information seems to be very helpful for all developers.Thanks.